The main purpose of this site is to serve as a directory of citizen groups operating within Alabama formed out of concern for natural resource and environmental issues. We have created and maintained this site to document the number and range of interests of such non-governmental organizations (NGOs) in Alabama, and to facilitate communication between groups which share common interests. We have included links to NGOs in neighboring states and to several government agencies active in natural resource and environmental issues. Our primary interest, however, is with citizen groups within Alabama. Disclaimer: Inclusion in this directory should not be taken to mean that those involved in creation of this site agree with or support the concerns or actions of any group listed here. Similarly, inclusion in this directory does not mean, express, or imply that Auburn University or any administrative unit or individual employed by Auburn University supports the concerns or actions of any group listed here. This said, a key function of a university in a free society is to encourage the exchange of information and perspectives. We believe the Alabama Grassroots Clearinghouse is consistent with that mission. This site is constantly under construction, so if you see any information missing or incomplete, please e-mail us. In this directory you will find a list of organizations in Alabama. (Click on one of the boxes below to see a list of organizations in Alabama). 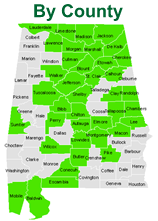 We also have a listing of the groups in Alabama that are no longer active. There are a few groups that are located outside Alabama that work on issues within Alabama. These organizations are listed on the "Groups Outside Alabama" page. Other than the directories, there is also a "tools or links" page. This page has information that you, as a grassroots activist, may find helpful in your work. For many years, Laura Robinson (now Dr. Laura Lhotka) managed the Clearinghouse and interviewed many group leaders and members for part of her doctoral dissertation. Those interested in her work might find this paper of hers (jointly authored with her major advisor, Conner Bailey) of interest. The paper is academic in nature, but those who visit this site may find the results and in particular the figures quite illuminating. They show which groups in Alabama are most central in the exchange of environmental information and suggest why this is the case.